Nottinghamshire covers an area of about 840 square miles, and has a population approaching 800,000 (if anyone can find two sites that agree on the population, then you're a better man than I am). 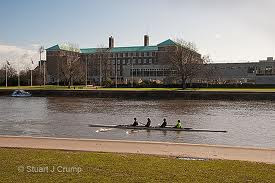 In the above building overlooking the River Trent on the 24th February 2011, the County Council will set its budget for the coming financial year. The detailed budget proposals are currently out for public consultation until the 21st January. This is something that every Council has to do, but in my experience it tends to be a rather meaningless exercise, as apart from some minor cosmetic tinkering, little will change, and the current proposals will be passed. I appreciate that this is a cynical statement, but I call on 20 - 30 years experience of being involved in public consultation to support my view. Keep giving your views though, as who knows, one day, pigs might fly. ﻿What impact will the agreed budget have on the people of Nottinghamshire? Well, when you think that the Council are looking to save about £150 million pounds over the next three to four years, with about £69 million pounds of these savings in 2011-2012, the impact will be huge. The budget proposals can be found on the County Council web site, and having scoured these proposals for the likely impact on the voluntary and community sector, there were three things in particular that drew my attention. Reductions in Voluntary Sector Grant Aid - Groups who use this grant aid tend to use it to cover infrastructure costs, which are not easy to find from other sources. The budget proposal is to reduce this grant aid by 66% from April 2011. This is a massive reduction all in one go, and one of the most high profile organisations to suffer in the County will be the Citizens Advice Bureaux. This will undoubtedly impact on their ability to provide specialist advice and help services when at the same time, the need for their services is increasing. Reviewing Mental Health Service Level Agreements - The proposal is to save 60% of the budget over the next two years, with 76% of the total saving coming in the first year. It is generally accepted that nationally, 1 in 4 people will suffer some form of mental ill-health in their life. For Nottinghamshire, this amounts to around 200,000 people. A number of voluntary organisations specialising in supporting those with mental health problems will suffer greatly in the next two years, and of course the result of this will be a knock on effect in the ability to help those who need it most. Reductions in Supporting People Budget - The County Council say that they are consulting on three options to reduce the budget over four years: £10 million, £12.5 million or £15 million. They are proposing the option of saving £12.5 million, which is a 56% reduction over four years. This will be catastrophic to many organisations, and to thousands of individuals who will not qualify for statutory support. Look a bit deeper into Supporting People funding and you will see what a vital asset it is. Supporting People is a programme that enables vulnerable people to improve their quality of life, independence and involvement in their communities. This is achieved through a range of high quality and strategically commissioned housing related support services, delivered by contracted providers to people living in supported accommodation throughout Nottinghamshire, as well as to people living in their own homes. There is well documented evidence to show that through Supporting People funding, there has been an average reduction of 71% in homelessness presentations across local authorities in Nottinghamshire over the last five years. Also every pound invested in the Supporting People programme saves £2.50 in other areas of public expenditure such as the NHS, the police, the prison service and Probation. It has been estimated that if the proposed cuts are agreed, that up to 400 jobs in the voluntary sector will be lost; some organisations will be forced to close, and others will have to dramatically reduce the services they offer to the vulnerable and marginalised people of Nottinghamshire. This comes at a time when the Prime Minister is also looking to the voluntary and community sector to play a major role in his "Big Society". I'm sorry, but draconian cuts on one hand, and dependency on the sector in the other hand do not go together. Residents are going to suffer. Organisations are going to suffer. I've seen this myself when I worked in East Sussex. My organisation had a fairly large Supporting People programme which successfully met the needs of the client group. The County Council decided to de-commission over twenty Floating Support services, and to commission two new services in their place. We lost all Supporting People funding, which was about 50% of the budget. Jobs were lost, services curtailed and clients suffered. Anyone who says that this will not happen is living in a different world. The gains of the past will be lost, and the needy of today will struggle to get the support and help they require to cope with the increasing demands of life. Everyone knows that there has to be cuts, but it's the size of these cuts that are horrifying those who are working with the vulnerable in Nottinghamshire. The Rt Hon Grant Shapps MP, Minister for Housing and Local Government has just written an open letter to the people of Nottingham, where he takes to task the Leader of Nottingham City Council for suggesting that Supporting People funding to the city has been reduced by almost one half. I find the 'formula grant' used by the Government to be quite difficult to understand, but it does seem that the Supporting People element is under 12% less for next year. The County and City do have to make across the board savings, but the Minister says, "the Government does not expect authorities to respond to reductions in their budgets by passing on disproportionate cuts to other service providers, especially the voluntary sector". So there may be hope yet on the 24th February. One of the largest charities in the area working in the field of homelessness, and with a huge investment in Supporting People funding is asking Nottinghamshire County Council to reconsider its proposals for cuts to the Supporting People budget, and to ask that it matches the Government's commitment to vulnerable people, and approve no more than a 12% reduction in funding in real terms over the next four years. Any more than this and there is a real danger of hundreds losing their homes, and thousands not being able to access services that they need. Come on Nottinghamshire.